Before electricity and gas people used plain old fire to make coffee! They used wood fire and big pots, and they ground their coffee with stones or wood. Fast forward to the present. 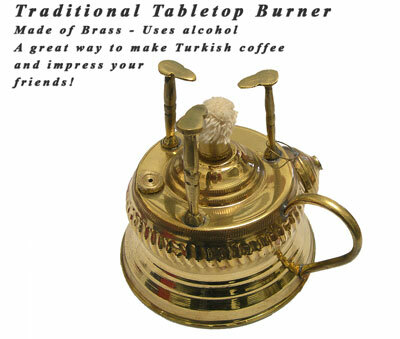 The tabletop burner was invented, which was a small device like a lamp. This burner uses cheap (impure) blue colored alcohol. 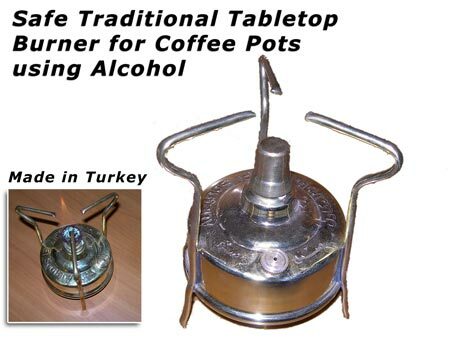 You light it up and it heats coffee SLOWLY so you can make Turkish coffee. Once the coffee comes to a boil you just blow out the fire, and you serve in your favorite cups. The burner has a beautiful traditional design and thats the reason that many people use it for decoration. Coffee enthusiasts use these traditional burners because of nostalgia of the good old days and also because they have the benefit that they heat coffee SLOWLY, which is the best way. Add water to the ibrik. Add coffee and sugar to taste. Use a lighter to start the burner. Place the ibrik on the burner. Karolos Tsiligirian is the Founder of FreshCoffeeShop.com, the online coffee store specialised in Turkish coffee and Arabic coffee products and accessories.